Tripp Lite's MT-6PLUS under-monitor console surge suppressor offers convenient AC and phone line computer power protection, individually controllable outlets and multiple power switches for remote control of connected equipment. High grade protection circuits utilize Tripp Lite's Isobar protection system with a generous combination of high quality components and unique noise filtration system. Robust surge suppression circuits with sine-wave tracking offer extreme levels of protection against the heaviest surge conditions exceeding IEEE 587 category A & B specifications. Isobar's unique protection system combines large toroidal chokes, HF/VHF capacitors and multiple layers of metal oxide varistors into exclusive isolated filter banks that remove EMI/RFI interference. MT 6PLUS offers 6 outlets total, 4 individually controllable via front panel mounted switches, one completely unswitched and one controlled by the master switch. Surge suppression rated at 1440 joules prevents equipment damage due to transient surges. Diagnostic LEDs confirm power availability and protection status, plus offer indication of line fault, suppressor fault and low voltage conditions. It could happen in the blink of an eye: a sudden power surge that damages or destroys your valuable electronics. And even if a catastrophic surge never strikes, smaller power fluctuations and electromagnetic line noise can cause incremental hardware damage and performance problems, and corrupt or erase important data. The solution to protect your electronic components from surge damage and performance problems? The MT-6PLUS with Tripp Lite's exclusive Isobar® surge suppression technology. This premium surge protector provides the best protection available for your PC and all electronics in a convenient, space-saving, under-monitor format. It features a high 3150-joule surge suppression rating—more joules mean more protection for your valuable components! The MT-6PLUS also features exclusive isolated filter banks to prevent disruptive line noise and interference between components from degrading component performance, helping to ensure that your equipment performs at its peak. The MT-6PLUS offers premium surge protection for PCs and all electronics. It incorporates Tripp Lite’s exclusive Isobar surge suppression technology to stop even the strongest surges before they can damage or destroy sensitive equipment. 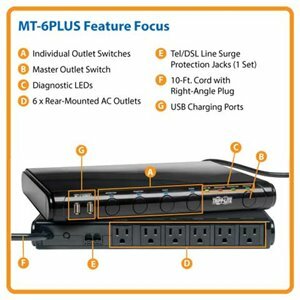 The MT-6PLUS provides 6 5-15R outlets, including four that are equipped with their own individual switches, plus single-line tel/DSL line surge protection. Two USB charging ports deliver 2.1 amps of power to charge the most demanding devices, including smartphones, tablets and MP3 players. The MT-6PLUS’s low-profile, under-monitor design makes it easy to integrate into any home or office PC setup. An eight-foot cord enables connection to a distant wall outlet, and a space-saving, right-angle 5-15P plug allows furniture to be placed flush against the wall. Phone connections represent a potential back door through which a damaging surge could reach your equipment. The MT-6PLUS includes one set of built-in tel/DSL (RJ11) jacks to prevent surges from damaging your computer, fax or modem (one 6ft RJ11 phone cord included).